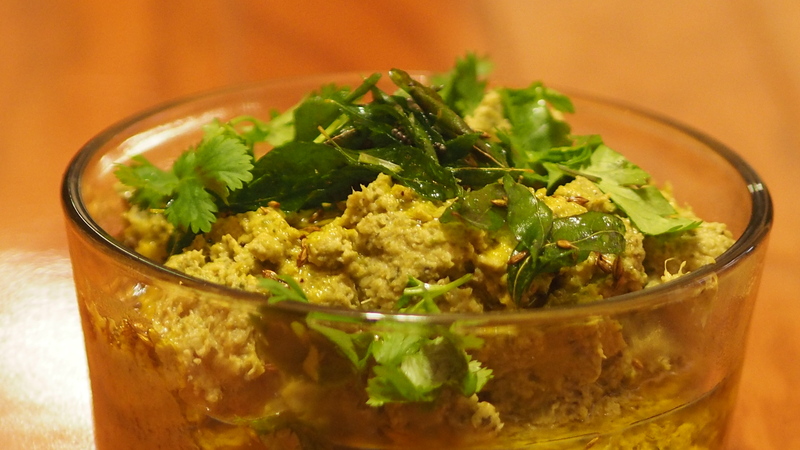 Chutney is typical Indian dip. It is a blend of vegetable, nuts or sesame seeds, garlic garnished with tadka (tampering). Cumin, curry leaves, cilantro etc. A wide variety of chutneys can be made with mix and match of different ingredients. Not every vegetable and ingredient goes together. 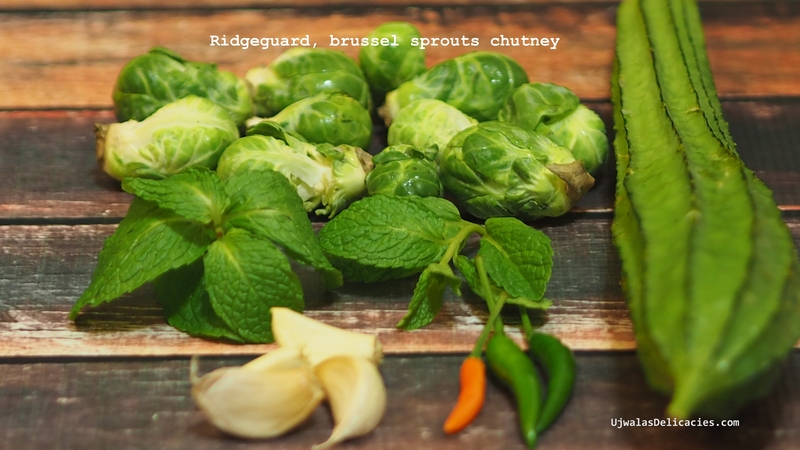 Plain Ridge guard (Beerakaaya) chutney is popular dish in south india. But ridge guard with Brussel sprouts!!!! A brand new chutney. Brussel sprouts are not available in India. I have not seen them till after I landed in United states. I wondered for many years how to cook them. Tried sautéing, salads and in tomato gravy. Didn’t quiet liked those. It popped in my mind one day why not make chutney!!! There it is – Another success recipe. I hope you enjoy. 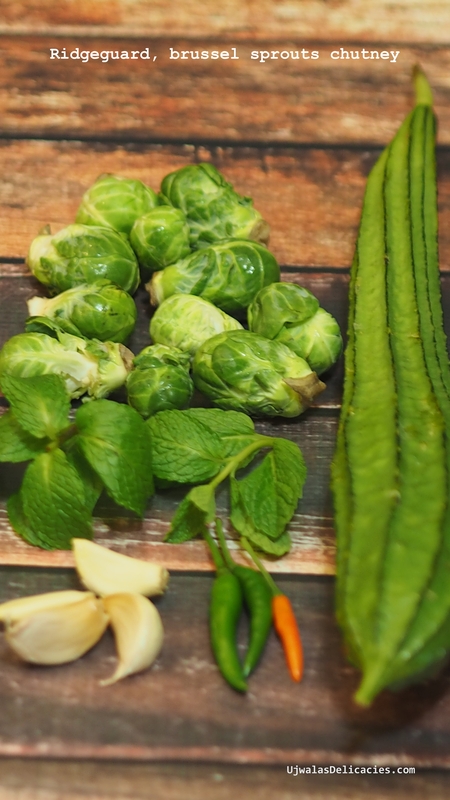 In the picture clockwise – Garlic, Mint leaves, Brussel Sprouts, Ridge guard and green chillies. This dish is Gluten free. It can be made nut free. Replace pistachios with roasted sesame seeds. 2 Tbsp - Oil of your choice. I used coconut oil. Soak Tamarind for 15 mins. If you are using coriander seeds, dry roast for 5 minutes. Dry roast pistachios for 5 minutes on medium heat. In a pan, pour your choice of oil. Sauté Ridge guard, Brussel sprouts, mint, green chillies, garlic for 2 mins. Add salt. Close the lid and cook for 2 mins. Open lid and cook till all water evaporates. Let it cool. Grind coriander seeds first in grinder. Because they need be pulsed till fine powder. For this reason I keep ground coriander seed powder all the time. Then add pistachios and grind. Make sure there is no water left before grinding vegetables. Now add remaining ingredients including salt. Squeeze tamarind for pulp, add to this. Grind to paste. Mix with spatula if needed. In a small pan, heat your choice of 2 tbsp oil. Add mustard seeds, when they splatter, add cumin. Add urad dal, curry leaves and turmeric till they splatter. Pour this tampering over chutney and mix. « Fig Salad with kale, lettuce leaf, pomegranate.